The moment we set our eyes on this traditional Maharashtra wedding held in Gurjar Sutar, an intimate indoor venue in Vile Parle, Mumbai that played perfect host to Anuradha and Ameya’s beautiful Maharashtrian wedding, we were sold. 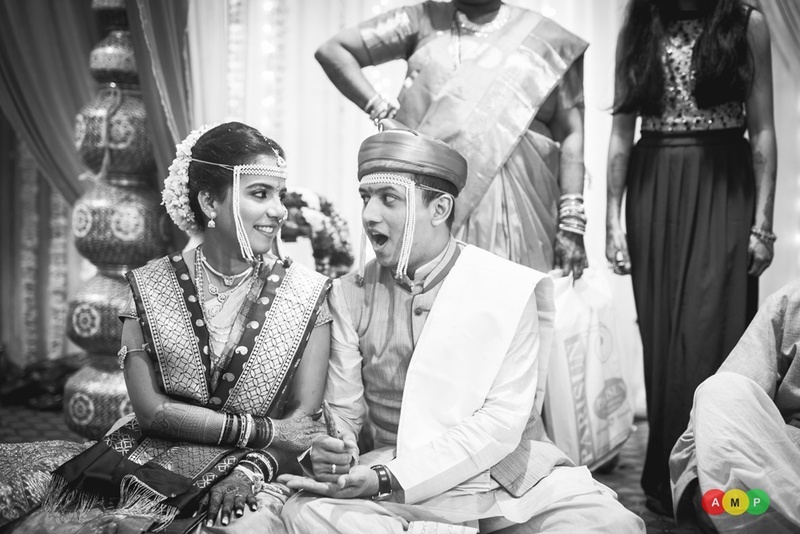 The brilliant team at Anupam Maurya Photography captured this entire wedding in black and white – at first we were a little disgruntled with not being able to see the colour of the bride’s stunning Kanjeevaram saree, her jewellery or the grooms dapper suit – but the more we looked at these wedding photos, the more the we were blown away by the rawness of every emotion captured in that monochrome tone. The way AMP team played with light, contrasts and white balances proved that BnW photos speak just as much as coloured photos do, often more. Monochrome focuses on people, less on things, so much so that in comparison to this one, other weddings might start to look too busy. Scroll down to take a look at India’s first Wedding shot in Black and White by Anupam Maurya Photography. - As sweet as the sound of their alliterative names was Anuradha and Ameya’s wedding album shot COMPLETELY in a monochrome tone. A Harvard Business School MBA and a soon-to-be USC graduate talk about the days their loved developed in the majestic hallways of St. Xavier’s College, Mumbai. Conversations over chai at a tiny shop called ‘tum-tum’ where love grew over pieces of Indian classical music and general shenanigans. Making time through the busyness of the big city life, Anuradha and Ameya put in all the effort in late night chats, and heart-to-hearts before the sun rose up again – it’s always the little things that make love last through the strongest tests of life. - Staying two worlds apart, quite literally – Anuradha was here in India making sure every detail of the wedding was done to perfection. Ameya, on the other time barely had anytime as he just finished a year at Harvard and flew down to India in time to get married! This beautiful couple had an early morning Maharashtrian wedding followed by a quick reception where everything was wrapped up by 5 pm – short and sweet! Being part Tamilian and part Maharashtrian, Anuradha chose to wear a stunning Kanjeevaram saree for her wedding rituals being done in complete Maharashtrian style. As the makeup artist went about brushing the compact onto her face, all of Anuradha’s friends were going gaga over her look. Anuradha was a gushing bride who cheerfully made her way through the wedding smiling and waving to everyone. Ameya was equally exuberant and he looked dapper in a silk kurta and a traditional pagdi made famous by Bal Gangadhar Tilak. Every photograph expresses the enthusiasm they had for this long awaited day.